Emmett is a Pony of the Americas gelding. He was born in 2001, and he is about 14H tall. 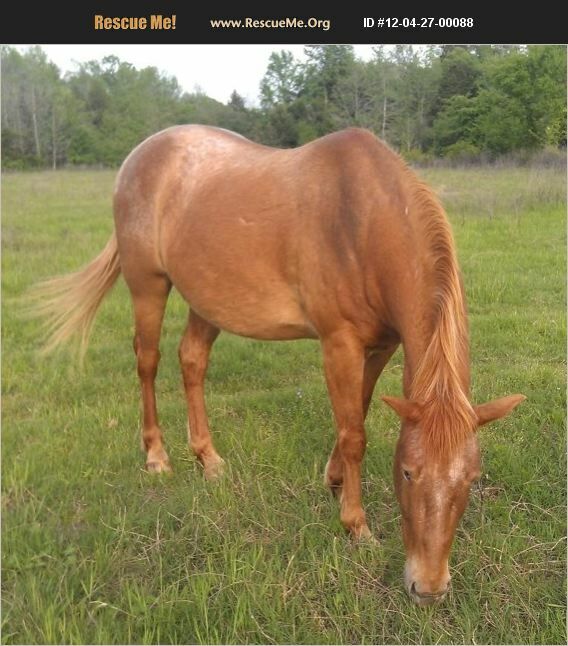 Emmett was acquired with 64 ponies from a neglect situation in Lewisville, Texas. Emmett works better for people he knows than he does for strangers. Even with people he trusts, it sometimes takes a few minutes to catch him. Whether or not Emmett stands for the farrier depends on how much he trusts the farrier. Emmett is very treat oriented - the more treats you give him, the more he likes you! Emmett is halter-broke, and leads from either side on a loose lead, bathes, ties, fly sprays, and leads over obstacles. Emmett longes well and has been long-lined. He had 20 days of undersaddle training with a professional trainer, and he was green broke to ride. When Emmett was being ridden, he hadn't yet learned the cues for trotting and cantering, so he did best at the walk. He has also been walked over ground poles and between barrels. However, Emmett has not been ridden in a long time, so he will need an experienced rider/trainer to refresh him and help him progress in his riding abilities. Emmett is located in Lucas, Texas. Hope for Horses Equine Rescue, Inc.